In the last decade, the Morgan factory has tried to create tool space, I imagine trying to compensate for the disappearance of the tradiioanl tool box on the bulkhead. However, their attempts have been cheaply made and break/crack. Their primary sadness is they also prevent the formerly easy access to the rear axle area. I constantly suggest to intrepid owners that they cure this. When we restored Humpty in 2005, Kevin Vernon and Tudor Motors suggested we create some additional storage capacity. Considering how much mogging we do each year, any extra space is a blessing. 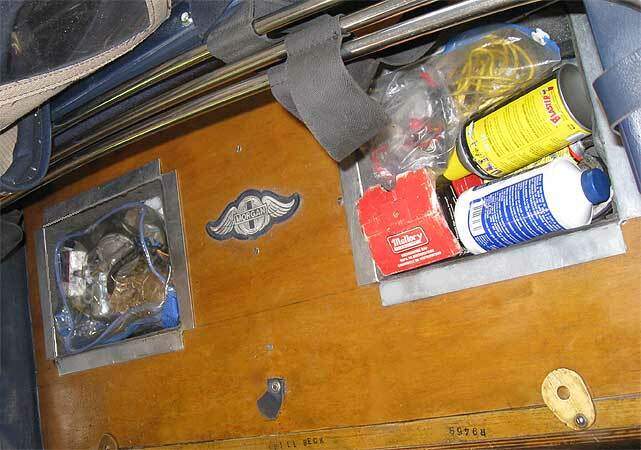 Kevin had fashioned aluminum containers he had dropped into his Morgan's rear compartment lid (aka the parcel shelf). We decided to do the same with my car. With Humpty, (a 1990 Plus 8 with a suspension hoop), we got in 4 boxes, 2 larger ones to the rear and two smaller ones forward of the suspension hoop. With the Phoenix, (BTR axle) I was able to fit two larger containers at the rear. The extra space carries tools and many parts, for which I have had occasions to feel vitally grateful for..brake switch, starter relay, cap and rotor..the list is long of what you can fit. Kevin took advantage of every square inch with his four boxes..even shaping the left on to the differential. He also felt-lined the boxes. My work was less polished but as effective. No felt and only two identical boxes..though each is bigger than any of Kevin's 4. 4.5" from the rear of the rear bulkhead to the front flanges. 1 7/8 " from the wheel well to the outboard flanges. A few year's ago, the Factory began equipping each Morgan Classic with a storage tray over the rear. At first, the idea seemed excellent and overdue. Changes to engine management and the repositioning of certain components (like the fuseboxes) had eliminated the space tradiaionally used for a toolbox on the bulkhead in the engine bay years. The tray would make up for this lost space AND replace the tough plywood lid of yesteryear. The tray did not take as much advantage of the available space as the solutions above, but it was a step in the right direction. Sadly, like other things, their execution has proven to be less than ideal. The tray is made of plastic. The first rule of Morgan body materials (which I think of as the PLUS 4 PLUS SYNDROME is to recognise that the Morgan Classic chassis flexes. Anything is susceptible to its effect must be capable of flexing as well. Plastic cannot endure flexing. If the cars are used, the trays crack in a 1-3 years. That leaves the rear compartment vulnerable. There are two options. Or pay the Company substantially for another plastic tray that will crack or slip in a wood ply cover as the earlier cars have and try and find a place for your tools. The best solution, at the moment, (which also has the advantage of being proven and less costly) is to create the system above. WATCH THIS SPACE, THERE ARE MORE SOLUTIONS IN THE OFFING. We’ve all had to deal with the very limited storage space in our Morgans, and the fact that there is no way to secure things. We have wanted to take along tools, some spare parts, and other assorted bits, especially on longer trips. But when we have stopped for the night we don’t want to have to carry all that stuff into the hotel room. Nor do we want to leave it in the car and risk having it stolen. Well, here are a couple of solutions; a tool tray that mounts to the underside of the plywood package shelf behind the seats and a small storage box that mounts on the extended floor boards opposite the battery. They are inexpensive and easy to build and will allow you to carry along a fair amount of things. They don’t take up any of the precious space needed for your luggage, a couple of bottles of wine, etc. And, because nobody unfamiliar with Morgans would ever think to look there, they are reasonably secure. Your car should be able to take a tray this size, but make your own measurements and alter things as needed. To determine the possible depth, I made a small cardboard box 2 ½” deep and taped it to the underside of the package shelf directly over the highest point on the differential. My wife and I then bounced on the rear end of the car to attempt to bottom it. The box had been touched by the diff, but just a bit. I made another box 2 ¼” deep and repeated the experiment. This time there was no contact. Once you have verified the dimensions proceed as follows. Rip a 2” wide piece from the hardwood and trim it to 32” long. Dado the ends to a depth and width half their thickness. Rip another 2” wide piece from the hardwood. Cut two pieces each 11 ¼” long. Dado the ends to a depth and width half their thickness. Rip a 1 ¼” wide piece from the hardwood and trim it to 32” long. Dado the ends as with the prior pieces. These for pieces should now fit together to form a frame 12” x 32”. Trim the scrap left over from the second 2” wide piece to a length of 10 ½”. This piece should fit into the center of the frame as a divider and strengthener. Rip a final ¾” wide piece from the hardwood and dado the ends as above. This piece will attach to the underside of the plywood package shelf in your car. You may have to adjust the length of the three short pieces based on the actual thickness of your piece of hardwood. You will note that there is a piece of wood about 2” wide that runs most of the length of the plywood package shelf (see arrow) on the underside as a strengthener. This piece may NOT be square to the edges of the plywood – mine wasn’t quite. The tool tray will mount to the package shelf 2” from the rear edge. Mark the underside of the package shelf to show where the tray will mount. My shelf was 36 1/16” wide, so I measured in 2” from one end and 2 1/16” from the other end. Measure from the rear edge of the plywood shelf to the edge of the piece of wood attached to it at each spot just marked and in the center. Also measure the width of the piece of wood and its depth. You will use these measurements to cut notches in the end and center pieces of the tool tray frame so that the frame will fit snugly against the underside of the shelf. Cut the notches just a bit wide to allow them to clear when hinged. As you are assembling the frame and tray bottom, note where the hinges and latch pieces will be attached. Ensure that the screws that secure the tray bottom to the frame are not placed where screws that secure the hinges and latch pieces will be. Scribe lines 3/8” in from each edge of the new piece of plywood that will be the bottom of the tray. Drill and countersink holes for the screws that will secure the bottom to the tray frame. Be sure to drill pilot holes in the tray frame as you are doing this. 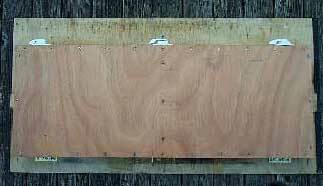 Run a bead of glue along the edge of the 2” x 32” piece of the frame and secure it to the plywood with screws. Do the same with each of the end pieces, also putting glue where they mate to the long piece. Be sure to have the 1 ¼” piece loosely in place to verify that the ends are properly positioned. Now glue and screw the 1 ¼” piece to the plywood. Mark the center of the long pieces and drill, countersink, glue and screw the center strengthener to the plywood, making sure the notch lines up with the notches in the ends. Secure the long pieces to the ends and center piece with the longer screws, using one at each corner and one at each end of the center piece. As you can see, I used a lot of screws just to be on the safe side. Turn the package shelf upside down and lay the tray on it. Mark the edge and end locations for the ¾” x 32” piece. Scribe a line 3/8” in from the edge line and drill holes 1 ¼” from each end. Turn the shelf right side up and scribe a line for the remaining screw holes. Drill and countersink the holes and glue and screw the ¾” wide piece to the shelf. 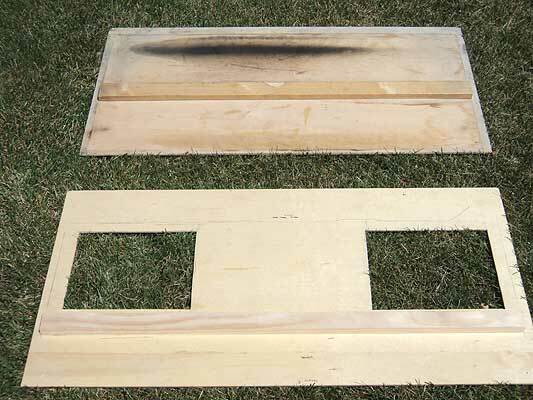 Make sure you drill pilot holes in that piece of wood and ensure it is facing the right direction to mate with the tray frame. Turn the package shelf upside down and lay the tray on it. Place the hinges along the back edge of the tray so that one is in the center and the others are about 2” in from each end of the tray. Note the hinge locations in the finished tray. Mark the locations for the holes in the package shelf. Do not mark the locations for the screws in the tray frame at this time as there will be weather-stripping on the upper edge of the frame. Drill the holes in the shelf, turn it over and countersink the holes. Put the machine screws through from the top and secure the hinges with flat washers, lock washers and nuts. You should have little or no machine screw extending beyond the nut if the screws were properly countersunk. 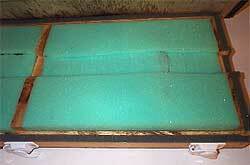 Give the entire tray, inside and out, a thorough treatment with the wood preservative and allow it to dry. Once it is dry, attach weather-stripping to the top edges of the frame, including the notches in the end pieces. Turn the package shelf upside down and lay the tray on it. Flip the hinges up against the tray frame. Push down above each hinge to compress the weather-stripping and mark the locations for the screws that will attach the hinges to the frame. Drill pilot holes in the frame and screw the hinges to the frame. Position the lower parts of the latches against the 1 ¼” wide piece of the tray frame similar to the locations of the hinges. Drill pilot holes in the frame and attach the latch parts to the frame. With those latch parts in the closed position, slide a top latch piece into place with the center latch. Push down on the shelf to compress the weather-stripping while holding the top latch piece up in tension against the bottom latch piece. Mark the holes for the top latch piece and drill them and secure the top latch piece. Latch the tray closed and repeat the process for the latches at each end of the tray. Open the tray and attach small pieces of weather-stripping to the outside of the frame at the edges of the notches in the end pieces and at the ends of those pieces where they mate with the piece attached to the shelf. These small pieces should overlap edges just a bit to help keep water out. Cut two pieces of the foam rubber to fit each compartment of the tray. 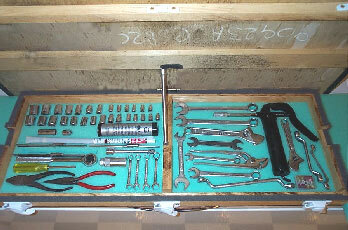 Place one piece in each compartment and lay out your tools as you want them. Be careful to avoid putting anything really thick (like a grease gun or cartridge) in the area that lines up with the notches in the end and center pieces. Note from the picture that I learned this the hard way. My tray still closes, but it is rather tight. Mark around each tool with a pen and cut out a shallow piece of foam so that the tool will sit in place. Cut a strip out of the top pieces of foam where the board attached to the shelf will come down. These strips should be about ½” deep at most. If you have thick items as noted, cut a bit out of the underside of the top pieces of foam so they fit better. You can find those spots by placing the top piece of foam in place and cutting all the way through at the ends of the thick items. Then turn the top piece over, locate the cuts you made and remove a bit of foam. Like the tool tray, the storage box is constructed from plywood and small pieces of wood, and is glued and screwed together. The required tools and materials will be similar. This project assumes your car has the floor boards extended behind the passenger area. In our car they extend back about 6” and the battery is mounted on them. It was behind the driver’s seat, but I moved it to the passenger’s side for better weight distribution when driving alone. Because the brake line and the emergency brake cable are on the passenger’s side in our car, the space available was just enough for the battery. The storage box could have been a bit bigger than I made it, but I used the Okoume left over from the tool tray project. 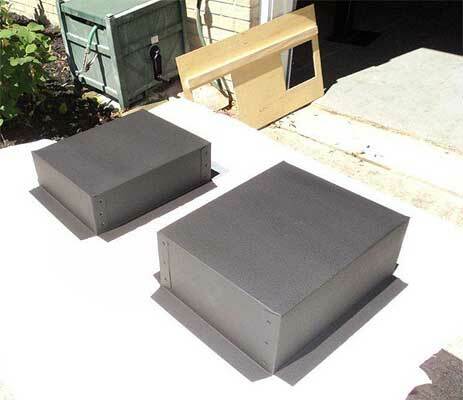 The part of the storage box that is against the plywood panel behind the seats can be built at an angle to match that panel and provide just a bit morespace. In our car, that panel is at a 15 degree angle from the floor boards. There is a piece of wood that runs the width of the car at the bottom of the plywood panel. That piece is 5/8” thick in our car. Rather than notch the box, I cut another piece of wood 5/8” thick by about 1 ¼” wide and the length of the box. That piece sits on the floor boards right up against the angle iron. The box then sits level on those two pieces of wood. There are 1 ¼” screws that go through the bottom of the box and through the new piece of wood and screw into the floor boards. There is a shorter screw that goes through the ‘back’ of the box and into the plywood panel behind the seats. Ignore the pieces of wood in the upper left of the photo. They were a discarded idea. 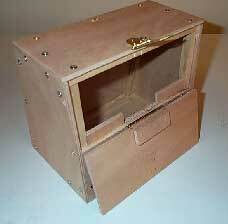 The box was made using scrap pieces of wood about ½” square. This wood was cut to fit inside each place where two pieces of the box mated. The plywood was glued and screwed to these pieces of wood. The ‘front’ of the box was made in two pieces. The lower piece was glued and screwed in place. The upper piece was hinged to the lower piece and fits inside the edges of the sides and the top. The front piece is secured by a small hasp that is screwed to the top and laps over the upper edge of the front. The original tools for your Morgan were a jack, jack handle, wheel spanner and a hammer. They would have been wrapped in brown paper and placed in the tool box on the bulkhead. The side screen knob Tammy bar would have been celeotaped to the jack. That was all you got. I believe my wife and I have done more Morgan mileage than most. We have travelled two continents (North America & Europe) for more than two decades for many months every year. Loved it! I am guessing at 350,000 kms in 4-5 Plus 8s, if you count bottom-up restorations. There are other long distance moggers we know, Bill Button, Joe Speetjens, Phil MacWhirter, George Dow (at one point), Tom Henderson (see his articles on creating tool and parts storage). But there is not a long list of such stalwarts. Long distance mogging requires a thorough knowledge of the car and the ability to fix it road side in a pinch. Either that, or one has can be find oneself stranded with all sorts of minor nonsense, especially on the newer cars which are less owner-friendly and attract less involved, less mechanically-skilled buyers. This small crowd have made storage and suitcase space an art form, esspcially those who travel with a companion. Traveling for an over-night weekend outing is one thing..mogging for weeks and months is another. Provision must be made for tools, parts and personal effects. These can provide a lot of storage space for the car's needs without a high cost. In the last decade, the Morgan factory has also tried to create tool space, perhaps trying to compensate for the demise of the bulkhead tool box but their attempts have been cheaply made and break. And sadly, they eleiminate the formerly easy access to the rear axle area. I constantly suggest to intrepid owners that they cure this. But one must not forget to provide for the occupants. :D The car's needs should be juggled with your needs and both shaped to the mogging venue of the moment. For example, in North America, accommodations are more traveller friendly. Super high speed washers and dryers are inexpensively available in ALL motels and hotels. On the other hand, Morgan parts are hard to find and take ages to receive as they are often not available except from England. Distances between stops are much longer. Ergo, we mog in North America with a higher parts-to-personal effects ratio. (3-4 days of fresh clothing will suffice for weeks in NA as they can be cleaned nightly). You do not want your packing to diminish your enjoyment of the car. Too often, owners pack their Morgan dangerously..altering its comportment. For example, the most obvious place for personal effects is on a luggage rack. However, this can block your vision at the rear, (one of the most accident vulnerable places for a low Morgan and, as the weight there is cantelevered beyond the axle, its effect is multiplied. It is not merely that the car is no longer as much fun to drive. It is dangerous. Silly way for you to spend your quality time with your hobby. We use two leather matching Gladstone-like bags (overnight bags that slope length-wise at the top) to pack our heavy items. We use them for our toiletries, shoes, laptops and place them in the compartment over the axle.The slope on the Gladstones is shaped like the rear deck slope so they can be pushed far back. Laptops in end pockets. Important pharmaceuticals in front or side pockets. Total length of two full bags must not exceed the length of the rear compartment or obstruct your seat positioning. We have access to leather makers, so we had two made in leather that matches our Morgan interior. We find that we can also accomodate our full top and our side-screens in the rear compartment under these two bags as well. So fully laden, the lines of the car are not prejudiced by a bundled lump behind the rear compartment or the screens, on or off. 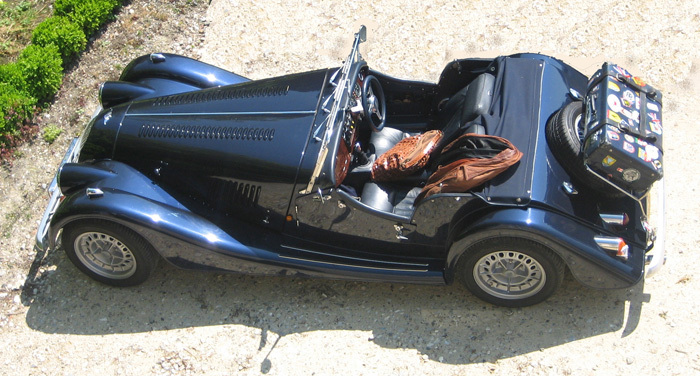 The Morgan Motor Company has shaped bags for the compartment. They do not have side pockets and we have not checked the dimensions and fit with full weather gear and sidescreens, but they seem very attractive. They are also very expensive..but for the extra 200£ you have an official Morgan logo, guaranteed to impress a porter in Moldavia or a airline person in Peru. Seriously, these bags are fine and price should not be a consideration for someone who has spent $100,000 on a hobby car. :D Ohter specialized offerings of the company in canvas or for the rear conpartment simply do not make sense. WATCHPOINT: For those of you with the "easy up" hood system, do your best. These hoods and the longer side-screens for the Long Door cars, severely limit storage for the occupants' personal usage and make distance mogging less convenient or pretty. For the cogniescenti, the bunched up hood (when down) prejudices the iconic lines of the Morgan side view eveidence of after=thought design. These changes should have been better thought out but at the time, Charles was more interested in securing Steve Simmonds famous business and creating a longer door. Village thinking. Ergo enter the Deadly Morgan Domino Effect. The saddest fact is that by the time these changes appeared, the MMC had finally mastered a leakless traditional hood and leakwise, the new hoods retrogressed leaking 60 years and made the new cars look sloppily designed. Mine (2002) was the last traditional hood systemmade for many years but they are again an option. It is inexplicibly expensive, when logic suggests it would be much cheaper. However, I recommend it as an option to insist upon. Audrey and I have found that our personal needs for weekend trips are amply satisfied by the overnight bags in the over-axle compartment. And though efforts have been made to make them look less ugly, luggage racks are not particularly pretty and when unused are analogous to vacant ski and bike racks on a Rolls Royce. So when unneeded I remove the racks, leaving only the lower brackets. We do not wish to ruin the Morgan aestheics if that can be avoided. This is a simple habit followed by all of the Morgan cogniescenti. With your heavier stuff over, now behind the axle, the lighter stuff, i.e. clothing, should go in your luggage on the luggage rack. With the lower weight items in the back, there is less prejuidice to the driving and handling. Vision: Morgans are vulnerable at the rear. They are low enough that cars following can miss them. (We were almost killed in such a mishap.) Additionally, too many people place luggage on their racks that block their rear-view mirror. Insanity and rightly illegal in most countries. Of course, some luggage racks contribute to the problem, by being made to fit too high. John Worrall (heart of England Morgans) makes a rack that allows for better vision by being placed lower at the rear. 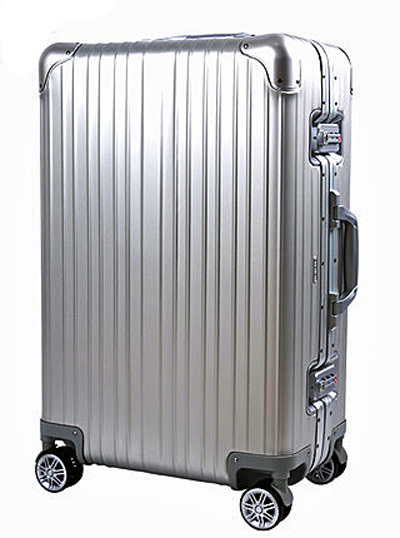 Of course, this also places the center of gravity of the luggage even further behind the axle. But the idea is smart..aesthetics and habits aside. This means that the dimensions of the chosen luggage must be precise so as to not block your vision. Width is not an issue in this, but height and depth are. 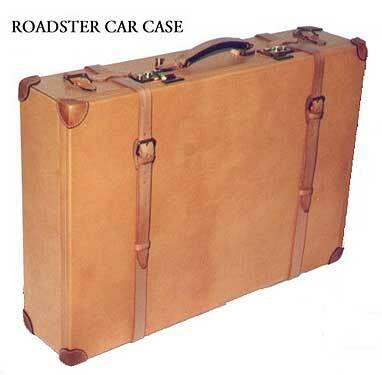 One of the finest made roadster rear deck hardcases I have ever seen was designed with this in mind. (4000£ range). Picture to the left. Notice how thin it is...to allow for clear vision to the rear. Here is an obvious MUST. The chosen luggage that you are placing on the rear rack must be rain-proof at the highest highway speeds. Trust me, the best (only?) time for a Morgan to use high speed Motorways, Autoroutes, Interstates, is when it is raining. (They are not a preferred venue in any other weather for this Mogger. After all, what for?). 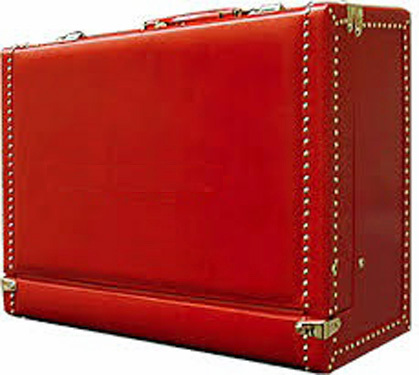 If the primary goal of luggage is to keep your clothes safe and unharmed, why on earth would you spend one pence on something that is unfit for the purpose you intend to make of it??!! This goes for any luggage that requires a cover (safety condom) to keep it water-proof in the rain. What silly nonsense! Also, we adore leather, but leather is heavy and is not waterproof. Once soaked it is even heavier and smells. We have to be smarter than that. Happily there are now space age materials out there that look like leather, are very light and completely waterproof. By the way, if you like the cover they sell, buy it only and have it cover an appropriately sized waterproof plastic storage container for £10. You will save $1000-3000, you will have dry clothes for your weekend and no one will be the wiser. 1. 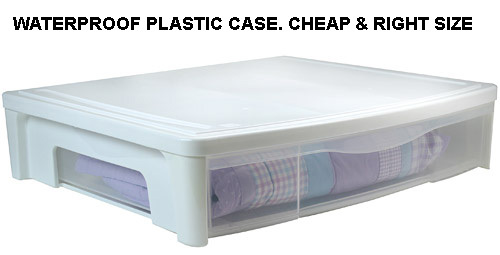 It must, on its own and without additional protection, keep your clothes dry in all weather. 2. It must not block your center rear vision. 3. It must not prejudice the comportment (and fun) of your Morgan. It would also be nice if your choice was aesthetically pleasing. Why buy a Morgan without trying to preserve that? But if you make this a first priority, be prepared to arrive at your destination and climb into wet clothes unless your choice meets the three criteria. 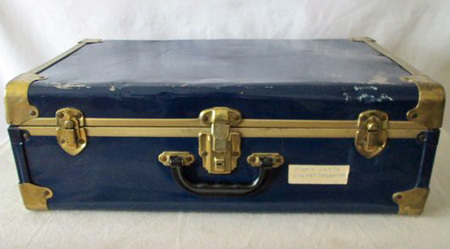 I have used a mid-size cases from a company called Globetrotter for 20 years (founded in London in 1897). It was originally British-owned, ofcourse, but it was bought over by Japanese interests about 15 years ago..after which the prices skyrocketed. :( What I used to purchase for 150£ now costs 10 times that!.and they are often sold out. They now have choice stores everywhere.. (see their store locator function). I usually buy from Harrods in London or their proprietary store in the same city. They are made from some proprietary hearty lightweigh space age polycarbonate (aka plastic). They are trimmed in metal and leather corners to look golden-age-of-automobile compatible. They come in an extensive range of colours. They need no additional covers or rain protection. These Globetrotter cases come in a huge range of car-matching colors, and can be had with discrete rollers and even straps. 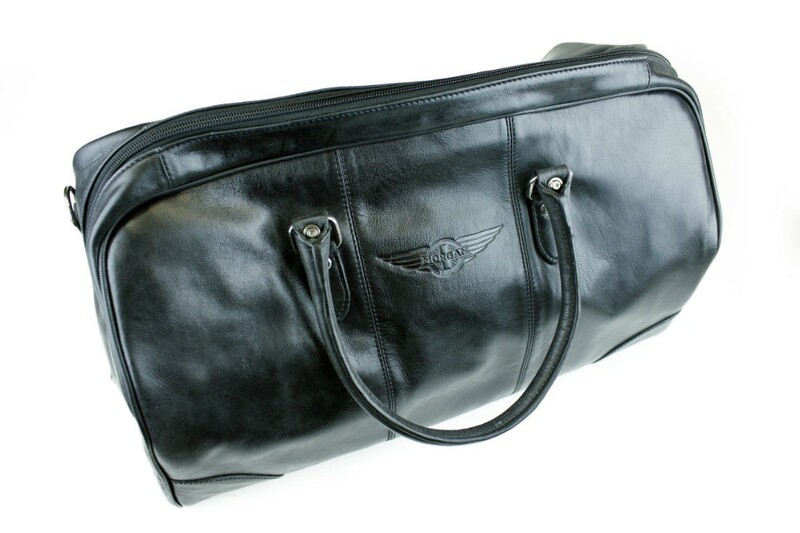 On the subject of straps, I used to order this luggage with them. 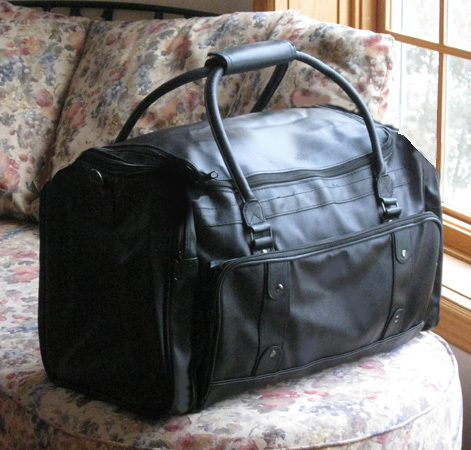 I soon realized that the extra expense is unnecessary as we all use leather straps to keep the luggage on the rack (I supplement this with a combination lock bicycle strap). They are leakless and reparable. I use their 30 inch models. Anything bigger blocks rear vision and encourages you to over-weight them. You can have fun buying place stickers and covering them as was the habit of a century ago. 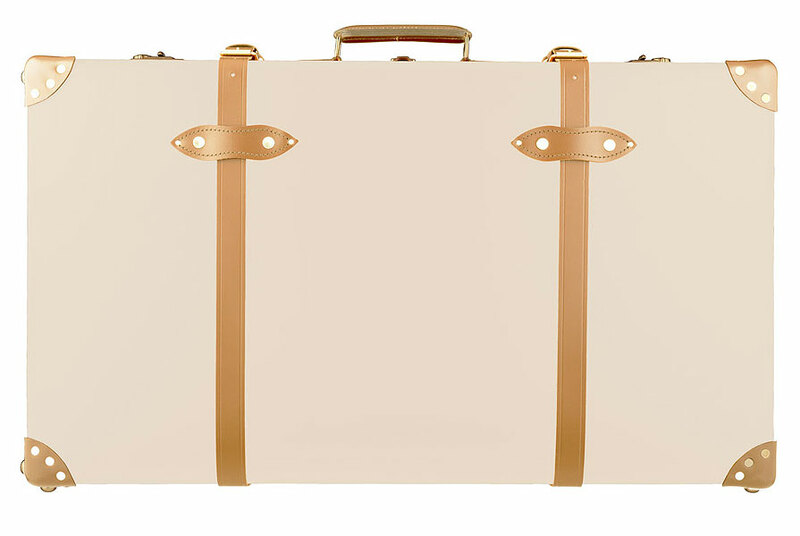 Other options for those of us who have not wish to get a bank loan is to buy a Morgan suitcase. Light metal cases. They are usually water-proof and sturdy. They can be had VERY inexpensively and can easily be painted the color of the car. One can even find them used in a vintage format from the Roaring Twenties and Thirties in many other metals such as tin with gold trim. Merely google or look on ebay! However, youwill often have to line or silicone the case to be perfectly water-proof. Of course, if mogging more than 2 nights doesn't happen in your life and aesthetics are irrelevant then almost anything water-proof at speed will do. However, try to avoid natural fabrics, as they smell when wet, and that will quickly become a permanent condition unlikely to impress when checking into a hotel or flight. I recently (February 2017) found a wonderful Parisien case maker on the charming OMA Old Morgan Addicts forum (French). This case maker has been making bespoke cases to size since 1847. Price around 2500-3000 Euros. However, he is concerned that his cases are not waterproof and/or the fellow feels more confortable if you buy a supplementary cover. :( By the way, the size he recommends for Morgans is a bit too large. If you make If you choose this source, ask for a smaller version, after you measure what will prevent your vision from being instructed (this varies with rack you decided upon. Normally, the maximum depth (or height when installed on the rack) should be 6.5 to 7in (16-17.5cm). I shall inform the supplier of this. I speculate that he CAN make his cases waterproof if pushed to it. I have done so with other similar cases.